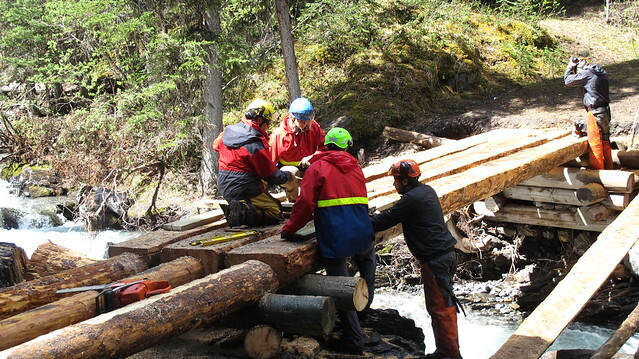 Restoring flood-damaged parks infrastructure in Kananaskis Country will boost tourism and enhance outdoor recreation. Kananaskis Country sustained the most extensive damage in its 36-year history from the June 2013 flood. The Alberta government committed $60 million to restore 41 damaged campgrounds, 51 day-use areas and over 160 kilometres of recreation trails with more than 65 trail bridges. To help tourism rebound, the Alberta government is also committing $18 million to rebuild the Kananaskis Country Golf Course and protect it from future flood damage. In addition, a $200,000 tourism grant will support the 2014 Kananaskis Mountain Festival. “As well as being much loved by Albertans, Kananaskis Country is a major destination for conference business, sports tourism and leisure travellers from across Canada and the world. These visitors don't just play golf or hike trails; they stay in hotels, eat in restaurants, shop in retail outlets and support our recreational tour operators, helping to ensure a strong local economy." "The floods of 2013 had a major impact on the economy of the Kananaskis region. We are thrilled to see the provincial government take an active role in the restoration of critical infrastructure such as the Kananaskis Country Golf Course and the numerous surrounding hiking trails, as well as supporting innovative new programs such as the Kananaskis Mountain Festival. Without this investment the negative impact of the floods would be felt for years to come." full-time equivalent jobs sustained provincewide: 3,023. When it was open, about 60,000 rounds of golf were played at the Kananaskis Country Golf Course annually, 85 per cent by Albertans. Designed by Robert Trent Jones, it is one of only two publicly accessible 36-golf courses in Alberta, and has been consistently ranked as a top 100 course in Canada by Score Golf Magazine. All but four holes were damaged in the June 2013 flood. The pro-shop, club house, tournament centre and other golf course buildings on higher ground were undamaged and are valued at $15 million. Trail crews are working on high-priority repair work. Nine trail projects are completed, 23 are planned for completion in 2014, and 43 are planned for completion over the next two years. Planning and detailed design is underway on priority campgrounds, group camps, day-use areas, trails, bridges, underground infrastructure and water treatment plants. More than 700 volunteers and 50 corporations have expressed an interest in assisting with flood recovery efforts, from trail work to program support. The majority of the investment to restore parks infrastructure damaged by the June 2013 flood is expected to be reimbursed through the federal government’s Disaster Financial Assistance Arrangements. Information on flood recovery work underway in Kananaskis Country will be available during Parks Day on July 20 in Bow Valley Provincial Park.